Where did I come from? Why do "I" exist? How should "I" live my life? Do people live their whole lives just for the tradition of "having a son to carry on the family name"? In 1988, not long after I joined the Yellow Sect of the Secret School, a Dharma-brother asked me: if I wasn't getting married, why didn't I leave the home-life? I was startled. Yes! Why don't I leave the home-life? Am I not always afraid of living the ordinary worldly life and anxiously searching for the key to liberating the mind? The idea of leaving the home-life thus planted itself in my mind. As a response from the Buddhas and Bodhisattavas, the affinity ripened. On November 6, 1988, my family and I took refuge with the Venerable Master. After I listened to the Master's talk, I left the Secret School. Although I had never heard of nor understood the Four Noble Truths—suffering, accumulation, extinction, and the Way—my aging grandmother of eighty-five was speaking this dharma to me, telling me to quickly leave this mundane world. Seeing my grandmother, who had bowed to the Buddha and been a pure vegetarian for two or three decades, being tortured by the demon of sickness, my wish to leave the home-life grew stronger with each passing day. In 1989 the ninety-three-year-old Abbess of Qing Quan (Clear Springs) Monastery in Miao Li, Taiwan, the Venerable Nun Miao Yuan, took my hand and very compassionately exhorted me to quickly exchange my worldly clothes for a robe and sash so that we could together save living beings and eventually be reborn in the Western Land of Ultimate Bliss. I was determined to leave the home-life; it was only the matter of place and time. And most importantly, who should be my teacher? I prayed for the aid of the Buddhas and Bodhisattvas. The Master led a delegation to Taiwan in 1989. Upon seeing my Dharma-brothers shave off their hair, I felt very lonely. The Master spoke a verse to the people watching the ceremony that went some thing like this, "You stand by the river, just watching what's going on in the river... that is useless." 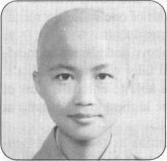 After the Master left, I looked at the Master's photo and prayed silently, "When will I become your disciple?" And I asked Guanshiyin Bodhisattva, "When will the time come for me to leave the home-life?" Finally, the conditions ripened. Two days later, a Dharma-brother told me that there was going to be a second leaving-home ceremony the following day. After pondering for two minutes, I started packing and went to the office to recommend myself for leaving the home-life. Fortunately, the Master compassionately granted my request. I finally shaved my head!